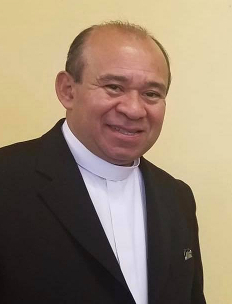 Father César was originally ordained to the priesthood in the Roman Catholic Church in El Salvador. After meeting the love of his life, Sylvia, he left the Roman priesthood to work as an educator. Within four years, the Episcopal Bishop of El Salvador asked him to take charge of a congregation in that diocese. Father César also served in the Episcopal Diocese of Olympia (Seattle and western Washington) before being called to Colorado. In The Episcopal Church, the Bishop's Warden - also called the Senior Warden - has duties similar to the church council president in other denominations. The People's Warden - also called the Junior Warden - is traditionally tasked with overseeing the upkeep and maintenance of the church facilities.